INSPECTORATUL TERITORIAL DE MUNCA BACAU ORGANIZEAZA VINERI 11.03.2016, ORA 10.00 LA COLEGIUL TEHNIC ”ANGHEL SALIGNY” BACAU, O INSTRUIRE DIN PUNCT DE VEDERE A SANATATII SI SECURITATII IN MUNCA, LA CARE SUNT RUGATI SA PARTICIPE TOTI LUCRATORII DESEMNATI DIN TOATE UNITATILE DE INVATAMANT DIN JUDET. 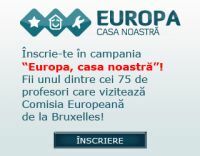 DE ASEMENEA, SUNT RUGATI SA FIE PREZENTI SI PARTICIPANTII LA CAMPANIA ”VALENTE CULTURALE ALE SECURITATII SI SANATATII IN MUNCA PENTRU FORMAREA UNEI CULTURI DE PREVENIRE IN RANDUL TINERILOR DIN LICEE SI SCOLI PROFESIONALE” IN VEDEREA OFERIRII DE INFORMATII SI CLARIFICARI LEGATE DE DESFASURAREA CAMPANIEI PENTRU ANUL 2016. VA RUGAM SA DATI CURS ACESTEI ACTIUNI IN NUMAR CAT MAI MARE.